The Soviets, in deciding on the location of the launch facility, chose the Tyuratam railway station–a stop on the line between Moscow and Tashkent, 124 miles east of Aral Sea and north of Syr Darya river. A small town was founded also–named Leninsk originally–to support the construction and then operation of the facility. Interestingly, the (original) town of Baikonur was nearly 200 miles northeast of the launch facility. Popular theory is that the Soviets called the site Baikonur in order to keep its location secret. But it wasn’t completely a secret: in the late 1950s a U.S. U-2 spyplane snapped pictures of the facility at Tyuratam. Over the years Baikonur’s importance grew. Not only was Sputnik launched there in 1957, but in 1959 Luna 1 soared toward the moon from the site, and in 1961 Yuri Gagarin made the first manned orbital flight in Vostok 1. Baikonur has been the site of tragedies too: 1960’s Nedelin catastrophe–in which a prototype R-16 exploded–reportedly killed a hundred people, and a number of rockets have exploded over the Kazakh step after launching from Baikonur. Time, the end of the Cold War, and the dissolution of the Soviet Union have not lessened Baikonur’s importance, either. In a 1994 agreement Kazakhstan leased the facility to Russia for 20 years, although Russia wanted a 99-year lease. In 2005 the lease was extended to 2050. When the United States mothballed its space shuttle program in 2011, not only did Russian Soyuz became the sole way to send manned missions to the International Space Station (ISS), but Baikonur became the only launch site used for such missions. In mid-May MexSat-1, a Mexican communications satellite, was lost when the Proton-M rocket it was on failed shortly after launch from Baikonur. Some think this contributed to the unfolding ecological catastrophe in the steppes that has seen more than 100,000 saiga antelopes dead. 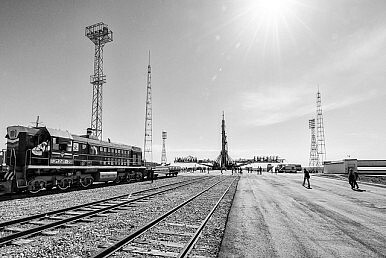 While Baikonur is not Russia’s only spaceport, it is one of the busiest and most versatile in the world, handling a number of commercial, military and scientific launches each year. The current Russian lease extends to 2050 and Russia has been investing in building a comparable site on its own territory. But the Vostochny Cosmodrome, being constructed in the Russian Far East, has seen its share of trouble. In 2011, when construction began, it was hoped the site could begin cargo launches in 2016. Completion has been pushed back to 2018, and in April this year a number of workers went on strike–they hadn’t been paid in four months.